Many were curious to see how Barry Trotz and Alex Ovechkin would mesh together when Trotz was initially hired back in May of 2014. After Ovechkin’s “disastrous” season (which was completely blown out of proportion – thanks, Adam Oates), many believed the evil Ovechkin was a “coach-killer”. That statement could not have been further from the truth. Oates just wasn’t that good of a coach; that’s it. And before that, putting Ovechkin with Dale Hunter was like putting Donald Trump and Rosie O’Donnell in the same room together to hug it out. It just was not going to work. Ovechkin was made the easy scapegoat. Insert Trotz, who brought a plan, leadership in the locker room, and 15 years of head coaching experience to a team that greatly needed direction. He took control of the team and implemented a style of play that can work and take a team deep into the playoffs. With that being said, I did see a few speed bumps last season that I believed hurt the Capitals’ potential success. Don’t get me wrong – I am a big fan of what Trotz did last season and what he and the team achieved, but I believe there are a few things he could do differently this coming season. Last season, many fans had to watch the development of Tom Wilson, Evgeny Kuznetsov, and Andre Burakovsky whither away on the 4th line – and even sometimes from the press box. No one wants to see that. Young players need to play and learn from their mistakes. They should not be buried on a team’s depth chart just to play sparing minutes every night. For example, Tom Wilson has a lot of talent. Lots. During the 2012-13 season with the Plymouth Whalers, Wilson had 58 points (23 G, 35 A) in 48 games. Even with that high offensive production, the 6’4″, 210 pounder managed to bring the pain with his heavy hitting and 104 PIM. He is more than capable of doing both. Unfortunately, Wilson was moved up and down in the lineup quite a bit. He did play the majority of his minutes with Ovechkin and Backstrom though (roughly 45%), but also spent 23% of his time with Jay Beagle and 20% with Jason Chimera – not something you really want to see. When playing with Ovi and Backstrom, they together had very strong possession numbers (a tad under 54.0 CF%). I was always a fan of keeping the three together last year, and I wished they had for a longer period of time. I think Wilson would have done a much better job developing his offensive potential with those two than dumping the puck with his best bud Michael Latta on the grind line. As for Kuznetsov and Burakovsky, I will group the two of them together. Both are extremely skilled, both have superstar potential, and both were poorly utilized last season. Kuznetsov, for example, played the majority of his minutes last season on that more often than not underperforming 2nd line with Marcus Johansson and Troy Brouwer. That was a mess from the get-go. None of those guys ever seemed to mesh and never got much going offensively. This was also at a time where Kuznetsov was making the very difficult switch the the center position. While his numbers don’t show much to get excited about (37 points in 80 games), we all saw his potential burst through in the postseason. He had 7 points in 14 games and absolutely took over in a couple of games. I just remembered being wowed by how confident he was skating with the puck. If he can take that confidence into this season, he will be a force. 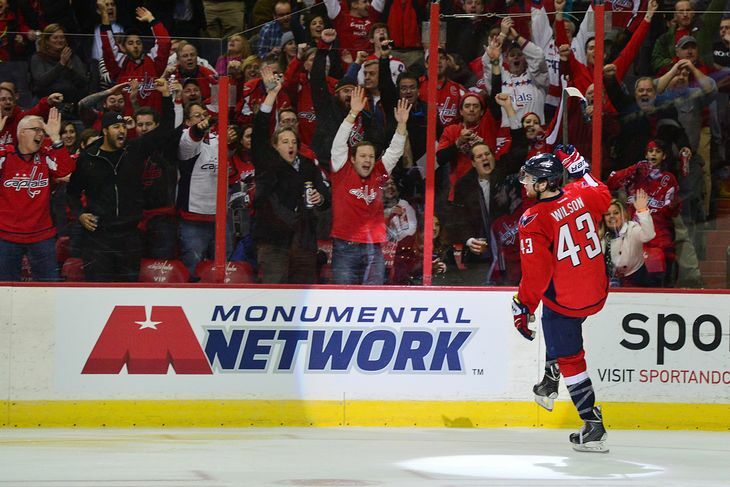 On the other hand, Burakovsky was someone most Caps fans were hoping to see much more of. He had very strong possession numbers (54.6 CF%), but would often make a rookie mistake or two that put him in Trotz’s doghouse. Because of that, Burakovsky watched quite a few games from the press box as well as garbage minutes on the 4th line. In 53 games, he played less than 10 minutes in nine of them. I mean, that is just wasting potential. I would rather have him dominate in Hershey while playing close to 20 minutes every night. That sounds like a lot better way to groom a potential NHL first liner. Hopefully this season, we see Trotz loosen his grip on these youngsters. The three first round picks are just on the brink of stardom if given the right opportunity. I know they will fly under the radar to most people around the league before the season starts, but watch out. They all have the chance to become very good hockey players. Oh boy. When the Capitals signed Brooks Orpik back on July 1st of 2014, the fan base collectively lost their minds. No, not because he is a bad hockey player, but because Capitals’ management gave him a ridiculous five-year, $27.5 million contract. I do not think there was a soul who actually had any type of excitement when this announcement came down. I, personally, didn’t despise the move initially, but did cringe every time I saw those contract numbers. Once the season had started and the Capitals were through their first couple months of the season, I was actually very impressed with Orpik’s play. Sure, his possession numbers aren’t anything to brag about, but he did hover around the 50.0 CF% for most of the season – which is pretty respectable. I miss very few games and when I would watch him, I thought he was a rock in the defensive zone for the most part. There were a couple of times where he got burned by a bad turnover or his lack of speed, but all-in-all he helped bring stability to a defensive core that really needed it. If you knocked the Brooks Orpik contract you can kick every rock everywhere. Culture changing presence. More hits than Ichiro in 2000. If you look at just the player himself, I am a big fan of Orpik. He is a solid defenseman who is a great guy in the locker room. When you look at the player and the contract, your feelings typically go in the opposite direction. But what’s done is done and there is nothing anyone can do about it now. He will be a member of the Washington Capitals for the foreseeable future and we might as well embrace him…just not alongside John Carlson. Yes, Carlson did have a career-year last season with 55 points (12 G, 43 A) in 82 games. Most people would look at that and be very happy with his production – but we shouldn’t be! Carlson could have much, much better numbers. Let us look again at yes, possession numbers. Carlson had very average possession numbers when he played with Orpik last season (49.7 CF%), which actually is not that good at all. But when you pair him with say Nate Schmidt, his CF% jumps to 57.7. Sure, it was only in a touch under 74 minutes, but the potential was there! More importantly, in the 215 minutes Carlson played WITHOUT Orpik, he had a ridiculous 59.1 CF%! Yes, a full ten percentage points higher than when he played with him. Carlson should be in the running for the Norris Trophy every season, unless he continues to play with Orpik. It just will not work. I hate to say it, but Orpik is really holding him back. Carlson needs to play with someone who can compliment his talents – not diminish. I realize they gave all of this unnecessary money to Orpik, but they should really consider bumping him down to the 3rd pairing. Trotz does roll all three of his defensive pairings quite a bit, so it would not be like Orpik never sees the ice. It is just Orpik should never see the ice with Carlson. It is just that simple. I am going to make this one short and sweet, and I think most would agree. Never ever put Ovechkin and Backstrom on different lines. Ever. There will never be a good reason to do so. 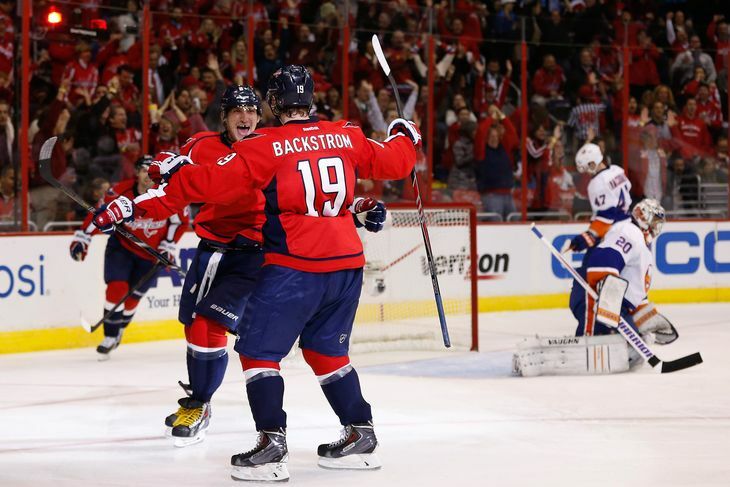 Ovechkin and Backstrom played together approximately 82% of the time last season. Strangely enough, it is also approximately 18% less than what it should be. Trotz occasionally tried getting cute by putting Ovechkin with Beagle together, which was always a disaster from the beginning. Ovi and Backstrom have played together since the beginning and have always dominated with each other. There are countless reasons (and statistics) telling us to keep the duo together forever. Breaking those two up does not help Ovechkin, Backstrom, or the team as a whole. Might as well never do it again Barry. I hope no one gets the impression that I am not a fan of Trotz, because I am. Very much so. I really liked the style of play and mentality he brought to Washington, especially after Adam Oates tried ruining the franchise (kidding, sort of). I believe Trotz will continue to move this franchise in the right direction, and hopefully, he takes a peak at this article and takes a few notes for himself.